This is my first blog, in conjunction with GeneaBloggers. So hello other GeneaBloggers! I think most genealogists seek an ancestor who was a king or queen, maybe relationship to a historical figure or a Pilgrim. Some of us even seek ancestor of some notoriety like Jesse James of John Dilinger. It offers relief from the many leafs in our tree that are just mundane. Now I would not mind a king or Daniel Boone or being a Polish Genealogist maybe Kasimierz Pulaski. I was not seeking a notorious, Black Sheep to liven up the old family tree, but alas these things do happen. OK, my Black Sheep is from Detroit, MI. 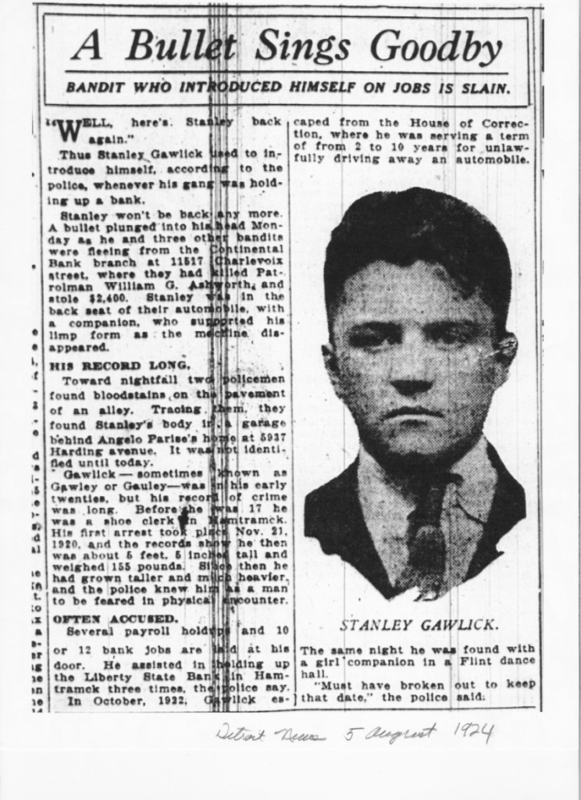 Actually, Stanley Gawlick [sic], really born Stanislaw Gawlikowski, was a street tough during the roaring 1920’s and a member of the “Shotgun Gang”. Stanley was born about 1902 in Poland and came along with his Father Antoni & mother Katarzyna through Ellis Island. I do not know how Stanley went bad. Well here is his mug, printed in the Detroit News, that fateful day, the 5th of August 1924. Now this newspaper clipping was saved by my cousin’s parents. When I asked my father, who was not born at that time, he said he never remembered anyone in the family speaking of this. This goes to show that historical newspapers can provide you with vital record info too, such as date of death and cause of death (gun shot wound). I am an aficianado of the Polish Daily (Detroit), named, Dziennik Polski. They provided an even longer article ! Well I said it was probably just a local story. 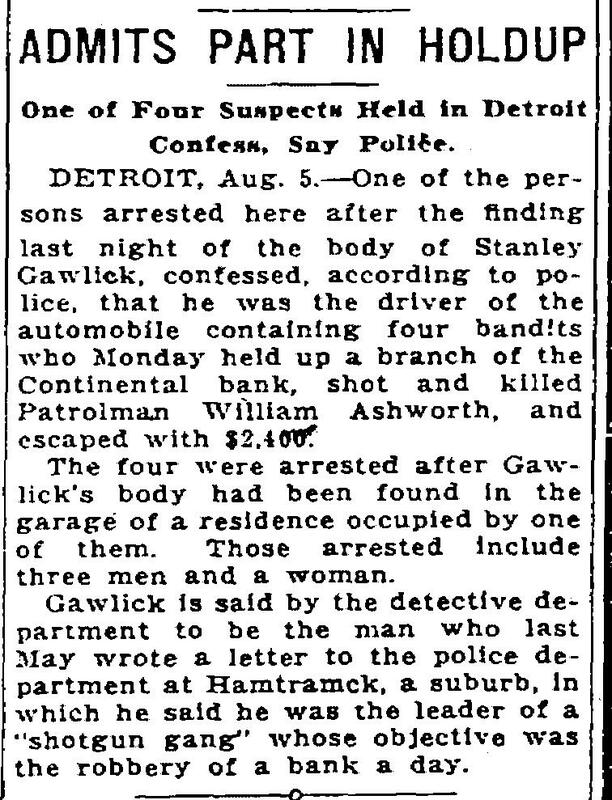 Then a year later, I found another article on this crime in the Cleveland Plain Dealer, that describes the crime. From the article in the Dziennik Polski, I am wondering whether the female robber may have been a common-law wife or whether she was just a gun moll. Along for an exciting ride. That’s my Black Sheep meme and I am sticking to it ! Let me hasten to add that Stanley and I share no blood. We are merely related by marriage. This jester has been a trusted advisor at the court of two kings and many companies, both large and small. As a matter of course, you develop a book of precepts to deal with a great many situations and to provide yourself with a context in which you ferret out a truth when you only have partial information. 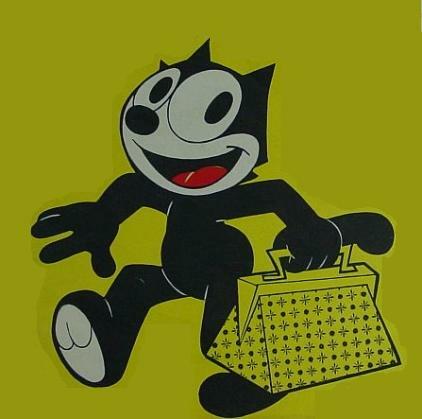 You also develop a toolkit and like the proverbial Felix The Cat, you pull something out of your bag of tricks, when the situation arises. I want to talk today about timelines and facts. As I was saying last paragraph, I had some precepts and platitudes to carry me through uncharted waters. One of my favorites was, “The man with one clock always know what time it is, but a man with two (or more) clocks is never certain what time it is.” Whilst I knew my ojciec (father) was one of seven children, I was fine. But imagine my confusion, as I was chiding my god-father (my Uncle Steve) that he did not know his birthday and that the Diocese of Toledo said, he was born a month earlier – as an aside, my uncle was correct and the Diocese of Toledo was wrong. A week later my uncle mails to me his birth certificate from Lucas County, OH and it does show his birthday as we always celebrated it. So it was good that I received another source fact for his birth. Now this is not a diatribe on whether the church was correct or the state (of OH) was correct on recording vital records. No, the state certificate had other “facts”. On it was a question, “Number of children for this mother”, with three parts. But clearly at the time Uncle Steve’s birth, he was the fourth child, not the 3rd. So my father was one of 8 (not one of seven). Ok, so there was another child who was born and died before my father was born. I could not expect him to know of this fact. I also knew that this child was not stillborn. So I mentioned this bit of unexpected news to my father. Now this triggered a conversation that we had never had. He said he was born at home (not in a hospital) and that in 1926 this was not uncommon. Well Stanczyk always knew things were “different” in the olden days. Then he proceeds to bring out his “delayed birth certificate”. Ok since there was no official record of his birth, he had to have a copy of his baptism and a witness swear that they knew his true birth date. Not too surprising, but interesting as I scanned his “delayed birth certificate”. A fascinating birth certificate from 1943 (showing my dad to be one year too young to serve in the military in 1943). But this birth certificate from Wayne County, MI had two questions on it: “Number of children born alive to this mother” and “Number of children still living”. Now with answers nine and seven respectively. Now hold on here a second, my father was the 9th child, not the 7th as he had supposed. Fortunately, I had learned of the marriage date of my grandparents and had the church record from Poland. They were married, the 28th of January, 1907 in Biechow, Poland. So lets start with that date in our timeline. 1909 or 1910 Alice (aka Aleksandra) Eliasz was born in Poland. 1? 9/15/1913 Valeria(Waleria, age 27) Eliasz arr. in USA with Alice(Alexandra, age 4) in Phila. So we have “gaps” in the timeline in: 1908, and 1909 or 1910, [ignore 1911-1912 when apart], 1915 as possibilities for Baby#1. This baby must be born before Steve in 1916. Baby #2 must be born between 1916 and 1925. We have “gaps” in: 1917, 1918, 1921, 1922, and early 1923, technically even in late 1924 could be another birth. Finally 1925 was possible. Now fortune smiled down upon me when I was searching Mt Olivet’s cemetery records for a missing uncle. They had a Henry Eliasz who died in January 1923. So I sent away for the death certificate and was shocked to find that Henry, was Baby#2 (of the two unknown siblings of my father). He was born to my grandparents, prematurely in December 1922 and died one month later in January 1923. One mystery solved. Now my aunt Alice maintained until her dying days, that she was born in 1910. I have no proof to the contrary other than the Ship Manifest on 1913 saying she was four in 1913, implying a birth year of 1909. As luck would have it, a genealogist in Poland whose family came from my ancestral villages agreed to perform some research for me. I was seeking my grandparents and any other born in Poland, their birth certificates. In the package I received was church record of a birth of a Wladyslaw Jozef Eliasz born on the 31st of March 1908 to my grandparents. So now, I had unknown baby #1’s birth and my timeline is now almost complete. I still need to find aunt Alice/Aleksandra’s birth record, but now I know, my dad was one of nine children (and that he was the ninth child born to Jozef & Walerya). If you get the Polish version (po polskiu), just click on the British Union Jack flag and you can see the English language version. Now I am jabbering about this today, because the PGSCTNE sent me their newsletter yesterday and in it was an article by Kahlile Mehr (whose presentations I have enjoyed many times). In it he speaks about the European archives on the Internet. So I posted on my avatar’s LinkedIn page a discussion, in Polish Genealogists, to see how many people have availed themselves of the Polish Archive’s databases. Now I have used the Pradziad database before to see what kind of vital records are held in archives (and those archive locations) for the parishes in Poland that Stanczyk’s ancestors come from (Biechow, Pacanow, etc.). I have from time to time tried to garner something of value from the Sezam database over the years to no avail. Well there are also IZA and ELA databases. Go here to see the four databases covering Poland’s State Archives. Now Kahlile’s article published in PGSCTNE’s “Pathways & Passages” newsletter talked about ELA and he said you could find “residence books” in ELA. Now these are not historical directories, but are inventories of families residing in some village (not necessarily parish) for some year(s). So I searched this database for my villages (including those villages that were NOT the parish). I got a lot of hits. The titles were in Polish. Ok Stanczyk, trohe rozumiem po polskiu. So to make sure I understood the titles returned I would cut and paste them into Google’s Translator, which does well enough to give me the gist of what I will find in these “fonds”. It even gives me the contact info for the archive location holding said title/fond. I love Pradziad and it definitely helps me plan for research in Poland. But now I am beginning to get a little savvy with ELA. I did find some possibilities. But I found one extraordinary nugget that I must go see. I found a Cadastral Map document for one of my ancestral villages. These are like the historical USA, Plat Maps which list land owners. Now I was surprised because Stanczyk’s ancestors come from the part of Poland that was in the Russian partition of Poland (often denoted, Russian-Poland, in US Census or Ellis Island Ship Manifests). I was surprised because I was told that Cadastrals were mainly in the Austrian or Prussian partitions of Poland. Now to be sure, my ancestor’s villages were just across the Vistula (Wisla) from the Austrian partition and for a few years were a part of the Krakow wojewodztwo (or departement in the Grand Duchy of Warsaw). So I guess they did a Cadastral map for this village. Now I know it exists and I must go see it. You should go search the Pradziad, ELA and IZA and SEZAM databases. Oh, you do not need to worry about diacriticals in your searches. In fact. I recommend you leave them out rather than use the wrong one or miss one. I tried it both ways, as Pacanow and as Pacanów. Both returned the exact same results. Likewise for other villages I tried. So fire up Google (or whatever translator you prefer) and go search and discover what treasures are in Poland’s State Archives. Do not forget about the Church Archives or the actual Parish’s books or the USC offices. But at least the Polish State Archives have their library catalogs on the Internet. This jester was gamboling through the ancient ☩ graveyards ☩ of Philadelphia again. In case, inquiring minds want to know. This time it was in the Mt Peace Cemetery on Lehigh St. You have the historic Laurel Hill, the Mt Vernon and Mt Peace cemeteries in very close proximity to each other. Many of the old tombstones are now illegible and the one I went to visit was disintegrated and is now just an empty lot. Genealogists and Historical Societies need to define projects to preserve the images before they disappear. I have begun to try and use this windows PC to post to the Internet. Besides, visiting cemeteries, I have an affinity for historical news papers. So I am back compiling my index of vital records and other genealogical materials from the Dziennik Polski of Detroit, newspaper. My website for Dziennik Polski is a Rootsweb free page . At present I have an index of names (mostly Polish) of over 20,100 to search and a summary that spans over 41,500 collected extractions from the Dziennik Polski. Now this was made possible by Genealogical Newsletters, such as the Eaglet published by the PGSM . A large number of names come from a list in the State of Michigan Library in Lansing, MI, composed by a good friend James Tye (“Jim”), a long time member of the PGSM. An overwhelming number of names come from a project done (and still ongoing) by the PGSCTNE . My own individual efforts have amounted only to about 2.4% of these totals. Perhaps one day, I will have amassed a database of 100K Polonia from Detroit, MI. Stanczyk, apologizes for being derelict of duty. Has it really been 2.5 months? Much has happened since my twin daughter Valeria died, that required Stanczyk’s attentions. Oddly it is another death that happened 80 years ago that caught my attention, as I try to muse along. It has been two years between updates (this fool’s Mac died, just before the economy died). So I have finally gathered a sundry of open source (i.e free) tools to edit/post files to web sites on an MS Windows laptop (distasteful). So look for future updates. At any rate, I found a Kędzierski who may or may not be related to a family that my grand-uncle Jan married into listed. This caught my eye and also a communique about a Marjanna Skowronkówna. 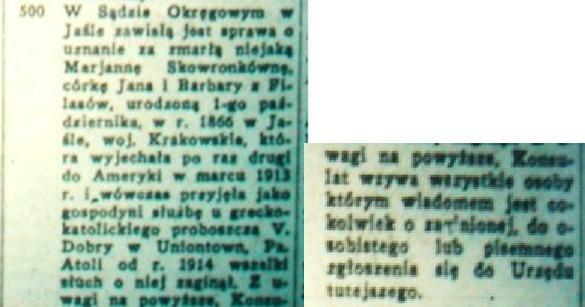 It appears her family in Poland (via the court in Jaslo in Krakow area) are trying to determine for certain her death. This woman was the daughter of Jan Skowron and his wife Barbara nee Filasow, was born 1st October 1866. She came to America the second time in March of 1913 (remember this is a 1930 newspaper posting) and the family has heard nothing since 1914 when she was last known to be a housekeeper for Greek-Catholic priest, V, Dobry in Uniontown, PA. As I said, this was posted 22-January-1930 issue of Dziennik Polski, in Detroit, MI [in case an ancestor reads/Googles this blog]. Now the above was written in Polish (I used Google Translate to help me), so it was not the fact of a daughter being deceased unbeknownst to her family that caught my eye, but the fact that her birth date, her parents’ names and her birth place were given. What immensely valuable genealogical data can be found in these Polish Consulates communiques! Now as for Pawel Kędzierski, a relative of his living in France, named Michal Kędzierski, was looking for him. They gave Pawel’s last known address as the state of Ohio. Note to Fool, check to see if these Polish Consulate postings appeared simultaneously through out USA Polish newspapers; I say this since we see Ohio and Uniontown, PA being written about in a Detroit, MI newspaper.